Finance Minister Arun Jaitley Saturday said the direct tax collection is expected to be Rs.14.49 lakh crore for fiscal 2015-16. Jaitley told the Lok Sabha while presenting the NDA government's first full budget that the budgetary estimates of expenditure for 2015-16 are pegged at Rs.17.77 lakh crore. The finance minister further informed parliament that out of the budgetary estimates of expenditure for 2015-16 non-plan expenditure is pegged at Rs.13.12 lakh crore and planned expenditure is expected at Rs.4.65 lakh crore. 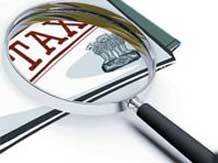 Jaitley further announced a reduction in corporate tax. He proposed to reduce the corporate tax from 30% to 25% over the next 4 years to be accompanied by reducing exemptions. "This (reduction) will lead to higher level of growth, accompanied by elimination of exemptions, which lead to disputes," Jaitley said. "High corporate tax with too many exceptions gives us worst of both worlds, we neither get revenues nor investments."